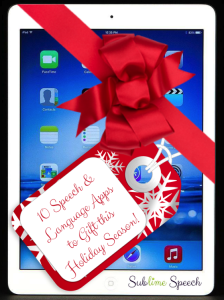 With the holidays here, the last couple weeks I have shared three posts for you with my gift ideas to help with speech & language skills. However some of my fellow SLP friends (And one of my Occupational therapy friends!) 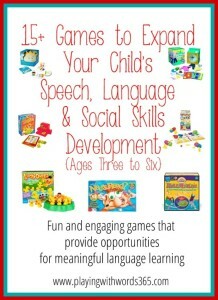 have ALSO shared their gift ideas for speech, language, social and sensory development! I wanted to provide you all with ALL these AMAZING gift guides in ONE PLACE for your shopping convenience…so here they are! 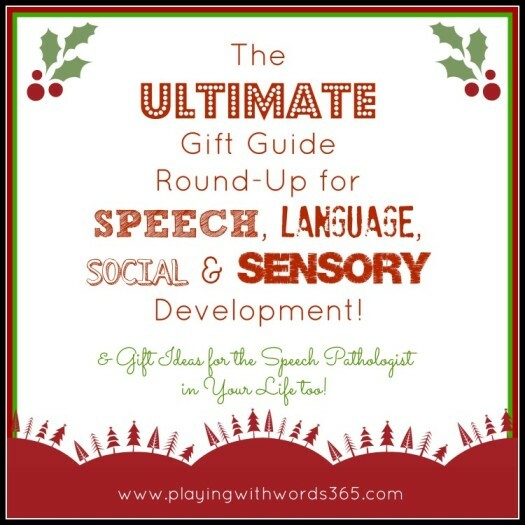 In addition…since so many of you reading this have children who are currently getting speech therapy, I am including a round up of gift ideas for that special SLP in your life as well! 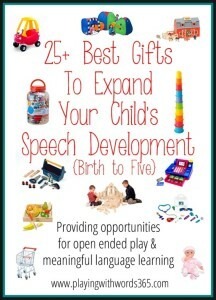 First up is my own 25+ Best Gifts to Expand Speech & Language Development: Birth to Five. 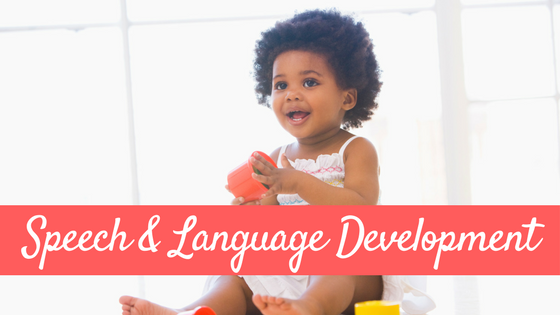 I cover mostly toys that help expand these skills in little ones. My friend and fellow SLP Kate also provides some great tips while picking toys for your little ones you may want to check out. Next…Stephanie (fellow SLP and mama to boy/girl twin toddlers) from TwoDaloo shares an amazing list of Battery Free Toys for babies and toddlers! Amazing list…I guarantee you’ll find something new there! 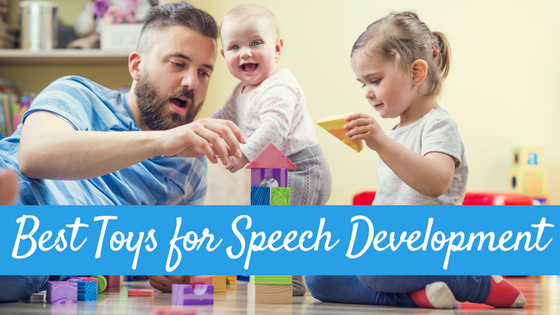 Also be sure to check out Speech Time Fun’s Top 10 Toys for Early Intervention and Preschool for some additional ideas from another SLP! My buddy Kim (Fellow SLP and mother to a toddler and baby) from Little Stories shares hear great list of 10 Awesome Book Themed Gift ideas. 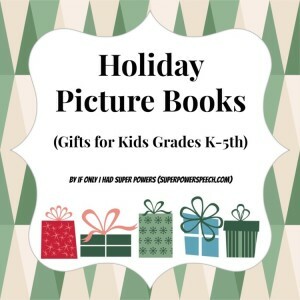 Looking for some great holiday picture books for elementary school kids? CC at If Only I Had Super Powers shares her top picks for us! I shared my top 15+ games for children ages 3-6 below. You may also want to check out fellow SLP Kate’s post all about how to pick board games for your family! Have an older child? No problem! 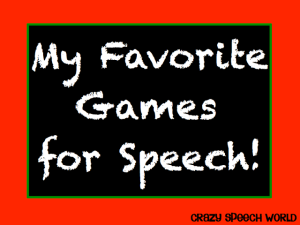 Jenn at Crazy Speech World shares her favorite Games for Speech & Language, Elementary Aged. So many GREAT games listed! Have a middle schooler or high schooler? WE HAVE THAT COVERED TOO! Speech Time Fun shared her favorite Games for Speech & Language: Middle & Highschool. In addition, Jessica at Constantly Speaking shares her top favorites for this age range as well in her post 10 Great games to Gift your 6th-12th Grader! Check them out! I personally find stocking stuffers hard! 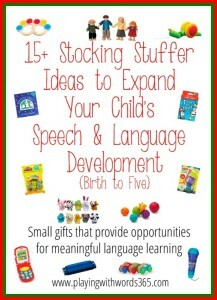 So I put together this list of 15+ Stocking Stuffer Ideas to Expand Speech & Language Skills in little ones from birth to about 5. 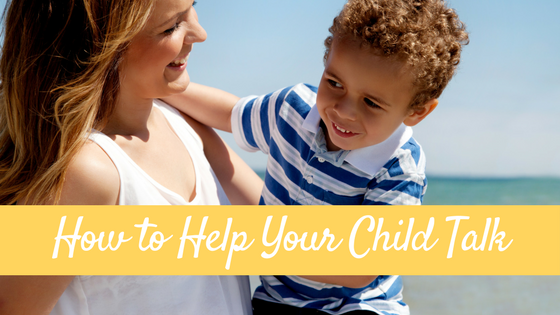 Have a child who is a sensory seeker? A child who loves certain sensory input? 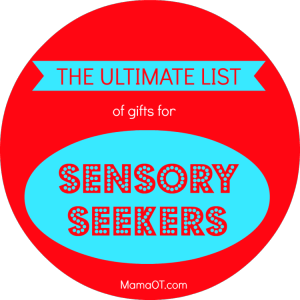 My friend Christie, an Occupational Therapist and fellow blogger put together the Ultimate List of Gifts for Sensory Seekers…and let me tell you it is A W E S O M E! I personally ordered SEVERAL items off her list for my kids not because they are sensory seekers but because they are just ACTIVE children! 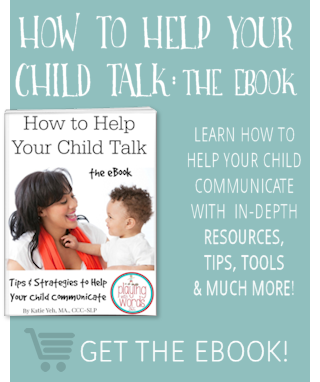 So check out her list…I bet you’ll find at least one thing you’ll want to get your children! Felice at The Dabbling Speechie also shares her recommendations for gifts for children with sensory needs! 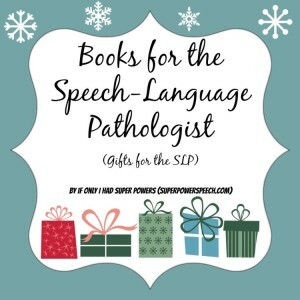 Looking for a gift for that special SLP in your life? Here are some ideas! 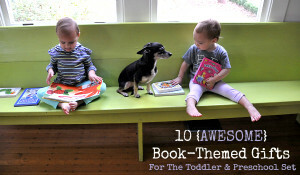 CC from If Only I Had Super Powers shares her top book pics for us on her blog! This is an AWESOME list! So many GREAT books! 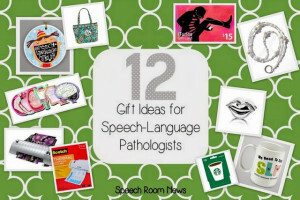 Then Jenna shares her 12 gift ideas for the SLP. These are all fantastic! Many SLPs today use the iPad on therapy, sp what better gift than some apps? 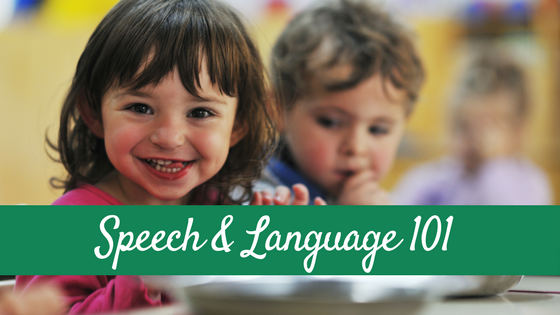 Danielle shares 10 great Speech & Language Apps! Are you a student OR know an SLP student you need to buy for? Carissa has that covered too! 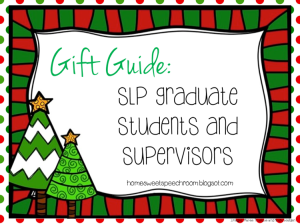 She shares her gift recommendations for SLP Students and their Supervisors! 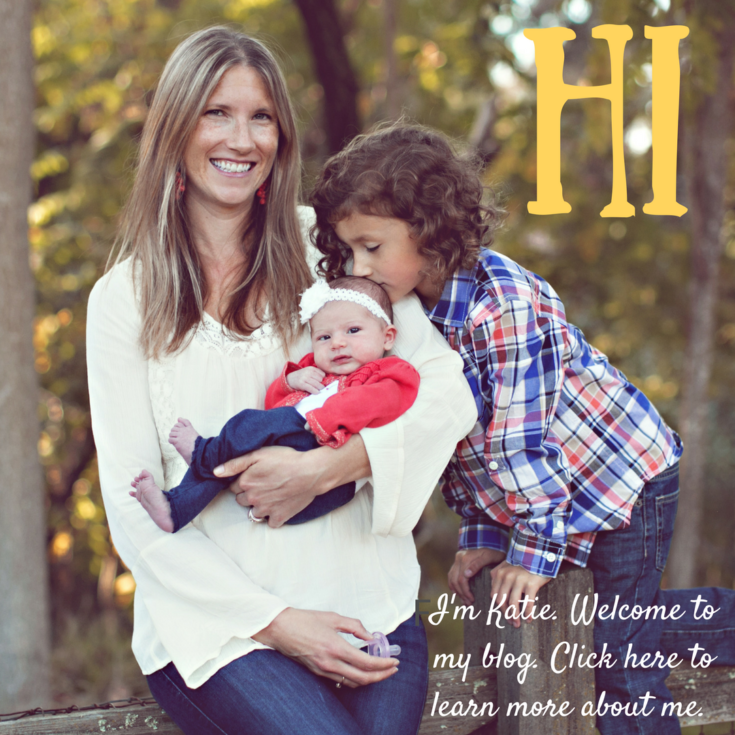 Do you have a busy mom in your life? 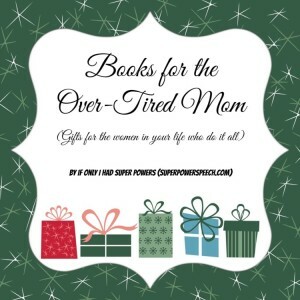 CC at If Only I Had Super Powers also shares her top book gifts (and a bonus gift idea!) for the busy mom in your life! So many great picks! There you have it! The ultimate gift guide round up! Happy Shopping! Thanks for all the linky love!! Great post! CC recently posted..“Jingle Bells” Speechy Style!